At the last day of Urban October, known as World Cities Day since 2014, the United Nations push forward international cooperation for sustainable urban development. This year’s theme focuses on innovations in city governance, in the face of challenges like urban sprawl, housing shortage, air pollution (smog) and traffic congestion. It further reminds us of the concept of open and diversified cities, requiring flexible governance schemes and novel partnerships. The transition towards Smart Cities is a well-known example. 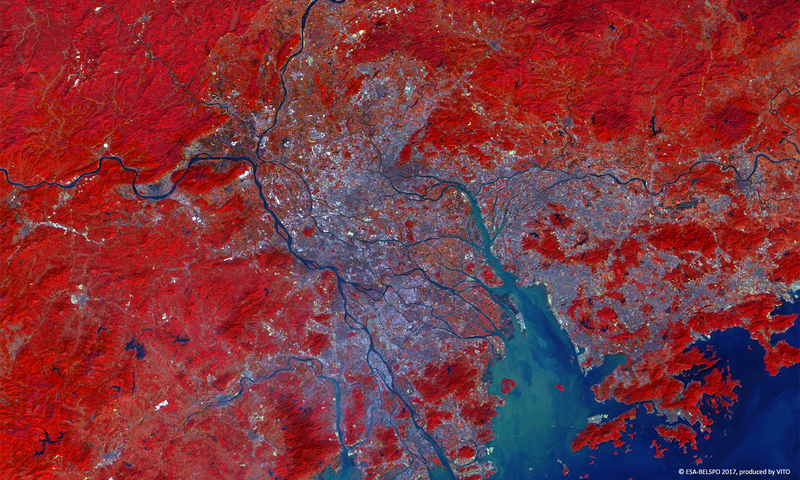 Guangzhou prefecture in the Pearl (Zhujiang) River delta is the largest metropolitan area in the world and one of the fastest growing and most inhabited in China. The city’s harbour is the fifth largest in the world (since 2006) and played a significant role in history as a terminus on the Silk Route. This 100 m PROBA-V image of the city nicely captures the delta and the urban area (grey).